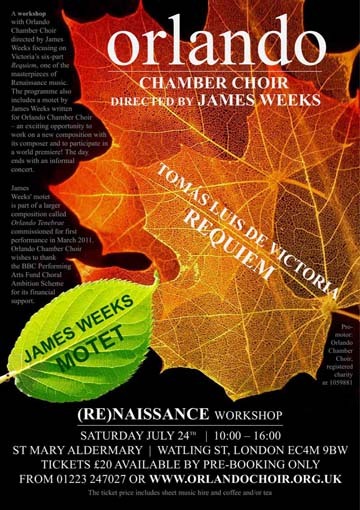 A workshop with Orlando Chamber Choir directed by James Weeks focusing on Victoria's six-part Requiem, one of the masterpieces of Renaissance music. The programme also includes a motet by James Weeks written for Orlando Chamber Choir - an exciting opportunity to work on a new composition with its composer and to participate in a world premiere! The day ends with an informal concert. James Weeks' motet is part of a larger composition called Orlando Tenebrae commissioned by Orlando Chamber Choir for first performance in March 2011. The choir wishes to thank the BBC Performing Arts Fund, Choral Ambition Scheme for its financial support of this commission.